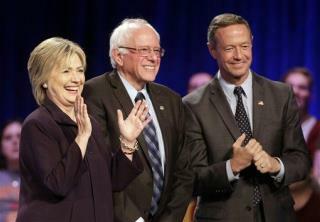 (Newser) – The second Democratic primary debate will go on as scheduled Saturday on CBS News, but the focus has changed dramatically in the wake of the attacks that left more than 100 dead in Paris, the Los Angeles Times reports. "You've got to get into how do you handle international terrorism?" says Steve Capus, head of production for the debate. "Do voters believe you are best suited for this? Are voters concerned about how you handle the situation?" CBS had planned on sticking largely with questions about domestic issues, such as ObamaCare and gun control, for candidates Hillary Clinton, Bernie Sanders, and Martin O'Malley. "Debate Will Tackle Terrorism." LOL. More like 'debate' will punt from their own end-zone. HRC's "opponents" are shills blessed by the DNC. Obozo the Clown said we have Al Qaida on the run, ISIS is a JV team, and global warming is a bigger threat than terrorism. We have nothing to fear. Except demwit rule.